August in Karachi harks the beginning of month long festivities. Monsoon showers break through the oppressive heat punctuated with the seemingly never ending load shedding, giving Karachiites a reason to smile. Green and white streamers flutter from their high perch on electric poles, white moons and stars sparkle off flags sold on the streets, and badges wishing the country longevity proudly sit upon chests of young and old Karachiites. Melodic patriotic songs play on the radio and television and green kites fighting strong coastal breezes elevate the spirit of every Pakistani living in Karachi for the biggest national day in the year, Independence Day! To many young people across the country, August 14 is nothing more than a day off, when they can let loose and have fun, but those belonging to the older generations believe that prevailing social and economic issues have subdued the zeal with which the day can be celebrated. For several years now, our national days have not been celebrated, as they should, due to one reason or the other. Sometimes the country is in mourning, at times the threat of hostility between our neighbouring countries and us loomed large, and at others it was due to internal security issues. But this year the government has finally decided to celebrate August 14 at official level, nation wide. This should mean that the cities will be lit up with fairy lights like they used to more than two decades ago, and people will come out during the night of August 13 to look at these decorations, as they used to. Manzoor Ahmad is a man of essence who has worked all his life to give his family a good life. He worked as a chauffeur for 20 years, till he experienced trouble in his joints, which caused a hindrance in his ability to drive. Hence having the responsibility of five sons and a wife led him to sell popcorn, chips and drinks in the vicinity of Quaid-e-Azam's mausoleum; it has been two years since he's been doing this job and he is very content with it. Now 51 years old, he still continues to work hard. Manzoor is an extremely courteous man, and even offered this writer a free cold drink while conducting the interview! "As a nation, have we achieved what we had expected from independence?" And, "are celebrations justified within the chaos the country has been thrown in?" are questions every Pakistani is sub-consciously asking himself. Most importantly though, one has to wonder, "what lies ahead for us as a nation?" Kolachi put these questions to Karachiites who have grown with the country and endeavoured to make it achieve the dreams of the city and its denizens; and to those young, dynamic Karachiites who are constantly on their toes, ready to push the country towards a better future. There are hundreds of Pakistanis who began new lives in their new land, on its very first day of inception. Renowned social worker Abdul Sattar Edhi is amongst those Pakistanis, a Karachiite who has celebrated the day, every year, for the last 60 years. "I was in my mid 20s, and moved to Karachi within twelve hours of partition," he recalls. To Edhi, the day meant more than Eid, and he would do every thing to make it a memorable one. "I attended the August 14 processions, decorated my home and adjacent lanes with buntings, and would march across streets with my friends, waving flags and chanting slogans of Pakistan Zindabad (long live Pakistan)," he says. Edhi adds that "women made up a majority of that march past as women at that time were very expressive with the love they had for their country." However as he approaches his 84th year, he doesn't celebrate the day except for visiting Quaid-e-Azam's mausoleum and decorating the Edhi Childrens' Home with flags and streamers. "I had great expectations of the country when I was young," he says, "but none were met." Edhi feels sad as the country that he wanted to be an honest and developed one, has turned in to a country where corruption, theft and inequality prevail. Arif Hassan has been living in Karachi since 1947, when he was four. Independence Day during his teenage years was always marked with the awe he felt watching the march past from Polo Ground to Victoria road, applauding the police band at Frere road and singing national songs at the school assembly, followed by a night out on the brightly decorated city streets. Today, Arif Hassan doesn't celebrate the day at all. "I don't see any reason to celebrate," he states emphatically. In his opinion, with the state of affairs in the country at present, and the failed expectations he had of the country, he cannot find a single reason to celebrate. "When I was young I expected Pakistan to be a modern, dynamic state, based on equity, justice, and humanity," he says. Arif Hasan feels that none of his expectation have been met so far because, "we are a corrupt, retrogressive political system and when there is such a system one cannot achieve much as it destroys institutions." Durryia Kazi, 51, doesn't remember much of how she celebrated August 14 in her childhood. What she can recall are the detailed discussions she had with her parents about the significance of independence. "They would discuss with me the importance of sacrifice and learning to appreciate efforts of freedom fighters in this regard," she tells Kolachi. Durriya says that these discussions had made her expect a far more humane country. However, to her dismay, things didn't turn out that way and now she feels she lives in a country where: " people have lost all sense of humanity." Durriya paints quite a depressing picture, as she speaks of a country where old trees are cut down to pave way for bridges, and the public beach is destined to be sold. During her teenage years, she would fantasized of a clean, green Pakistan that provided "a quality life for every citizen." She says that though her dreams have so far not been realized, she is counting on the next generation to change that. Durriya Kazi tries to make young people realize the importance of independence, "I always point it out when my students refuse to even fly flags, but then realize the value of freedom," she says. Durriya has interviewed a lot of people who witnessed partition for her documentary Meri Kahani meri zubani to be displayed during Shinakht, The identity project. For Javed miandad, August 14 meant lots of fun, activity, hanging around with friends and a day off when he was a kid. "There used to be a national holiday," recalls Javed, who would do his best to have fun that day. "I attended street functions arranged by the area people, listened to national songs played on loudspeakers and would be a part of march past at school." Javed dreamt of a Pakistan that equaled the developed world during his teenage years. "I was always impressed by the way governments worked for the welfare of people in countries like Australia and United Kingdom, and would hope that my country too would be like that some day." As the country completes 60 years, the star cricketer is no longer enthusiastic on August 14 as he feels none of his dreams came to fruition. "Today, people are poor, hungry and the majority doesn't even have the right to govern as the demand of being a graduate restricts them." 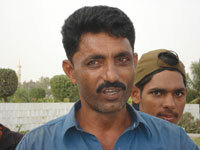 Javed feels that if education wasn't the criterion for freedom fighters, it shouldn't be one to access assemblies now. "Is this what we are celebrating for?" he asks, "The country's own people being excluded from the government because they have not graduated college?" Javed Miandad strikes hard against the idea of celebrating independence when a majority of his fellow citizens don't enjoy economic independence and the right to govern. Having worked for two decades with one of the leading financial institutions in Pakistan, Athar no longer feels motivated to wave flags and sing national songs on Independence Day. "I am dissatisfied with the country due to the nature of things here," he explains, "and the non existence of development." Athar says that the rapid development of countries like Malaysia and Thailand impressed him greatly when he would visit them in his younger years. "These countries gained freedom years after us but have now progressed more than we have." He says that he expected Pakistan to develop like these countries but after having lived many years in the country has found things go in the opposite direction. "We don't have social equity, the poor have remained poor over a span of 60 years and the education sector never progressed," he laments, adding that these factors make him foresee a bad future for the country, should they persist. "The thought of the kind of future we are leaving for our children frightens me. Youth today seeks to move abroad. Our man power is not trained enough. So what kind of future are we leaving for our children? A future with no electricity, water and infrastructure?" Following in his father Abdul Sattar Edhi's footsteps, Faisal Edhi is an asset to Pakistan and does it proud. He however, is not proud of the country nor does he attach any significance to Independence Day. "When 40 percent of our country men can't even afford one meal a day, we don't have the right to celebrate Independence Day," he declares. He acknowledges the fruits of privatization and the freedom multinational companies now enjoy in Pakistan, but believes that, "things will get better but not for the poor." Reminiscing, Faisal says that he was a high spirited teenager who went around the city waving his green flag with his friends. He, along with five other friends, would pile up on the same bike, chanting Pakistan zindabad and zoom across town.But such patriotic slogans do not touch him anymore, as he believes they are far too idealistic and bookish. "I have been listening to people go on about "hamara mulk yeh hamara mulk woh," forever. Our country is better than India yet we have seen no tangible progress, and have found that it was the country that gained independence and not the people." Contrary to Faisal Edhi, Moeena Niazi, a young architect still enthusiastically greets August 14 as she would in her childhood. She still decorates her home with flags with her children, wears a Pakistan flag pin to work and takes her children to show them the city decorated with flags and lights just as her father did when she was a child. "I was very optimistic when I was a kid and I still am," she tells Kolachi. Moeena still hopes that one day her country will make it to the point of successful development. "Despite so much pessimism among the people of my age group, I am still with my country," she says, adding that she tries her best to help the country achieve that goal by contributing as an architect. "I try to create the same sense among my children who can be negative about the country when they suffer here. When they curse Pakistan, I tell them they are cursing themselves because they are Pakistanis. I tell them not to hate themselves for being a Pakistani rather, fix what is wrong." Moeena hopes Pakistan will soon see a positive change. Though Imran Wasti had never thought of how a country should be when he was younger, but what Pakistan is today dissatisfies him. "I never wanted a Pakistan with its economy dipping, and terrorism at its peak," he thinks that terrorism has ruined the country and is a cause of discontent among the young lot. Haris, 24, was an active celebrator of Independence Day. He always tried to get the biggest flag and hang it from the roof of his house to the ground. However, he has felt his excitement vanish, as he has grown older. "I had always dreamt that we would grow technology wise and as an industrialist nation. That we would have fewer beggars and good people governing us but now I don't feel very kindly towards the government. Earlier we would see two beggars on the road, now it is six, and sometimes the whole family. The situation is disappointing." He adds that if the present situation persists, Pakistan's future will be bleak, "right now there is nothing that is good enough to divine a good future. The rupee's value is going down day by day. Commodities have increasingly become too expensive for a majority of the people. It is as though the system that was established has continued unchanged for 60 years. No change has come and people are just adapting to the system which will be disastrous for the country if it continues"
The inequality, rising poverty, insecurity both at local and international levels and violence have not only heightened the anger of people against the government but have make them doubtful of feelings they had once cherished as patriotism. On the eve of the 60th anniversary of Independence, one can only hope that those who recognize Pakistan's true issues for what they are, and can make a difference, will take all the necessary steps to do so. Although many elderly Hyderabadis believe that other occasions and festivals such as Basant and Valentine's Day have dimmed enthusiasm for Independence Day, perhaps the citizens are simply disenchanted as they have seen their city suffer many curable problems go unnoticed and unattended. Historically, the focus of all attraction on Independence Day in Hyderabad is the illumination of government buildings, but it is Phuleli and Paretabad where the day is celebrated with extreme fervour. The streets and shops of Phuleli and Paretabad shine bright with the lights strung around them, and festive decorations colour every corner of the areas. This year too, the streets of Hyderabad are alive with the sight and sound of celebration. 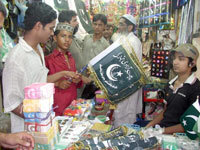 Stalls proffering tiny flag badges are doing booming business, whilst some girls choose to pledge their allegiance to the country by decorating their wrists with green bangles. Special programs are arranged to mark the day apart from the flag hoisting ceremonies in government departments as well as universities, Independence Day celebrations in private run schools have been decreasing over the last few years. A majority of private schools are resuming session on August 16 this summer holidays this year. With no time to prepare for shows celebrating Independence Day, it seems that school going children will not be marking the day with a special event as they used to. Some people are of the opinion that policy shifts in the government including price hikes etc. have had a large hand to play in this decline of zeal for celebrating the country's Independence Day. They believe that citizens are so wrapped up with day to day concerns, that they have little celebratory spirit left. Taluka city councilor Mubeena Khanum Beena tells Kolachi that she remembers Independence Day being celebrated exactly like Eid when she was a child, "and I am not even talking about a time too long ago, the enthusiasm still existed a few years back." She feels that although the prevalent unstable conditions of the country have caused general disinterest in Independence Day celebrations, observing the day has been, and still is, an important, lighthearted part of understanding the essence of the country and the its formation. There are some other ceremonies especially arranged for Independence Day that include theater and drama performances, but interestingly, the subject of these dramas doesn't isn't relevant to the day, or even the concept of freedom. They do however; succeed in entertaining large, diverse crowds. A government school teacher, who wishes to remain unnamed, cites the indifferent attitude of the government towards the day, as a reason for declining interest in August 14 as a day to celebrate. He says that previously, the government initiated celebrations and the practices towards special shows itself. Previously, says this teacher, attendance at these shows was a must for teachers and students, who loved participating in them anyhow. "You know how busy life has become, and people usually celebrate August 14 by planting themselves in front of their televisions and watching their favourite shows," says Yasir Akhtar, a recent MBA graduate. He says that the government is doing nothing for the betterment of the younger generation. Political turmoil in the country has risen to the extent that such celebrations and historic days don't matter anymore in their lives; problems such as unemployment take precedence over any celebration. But children like Ahsan, who is studying at a private school, still force their parents to purchase balloons and small flags well before August 14 and doesn't give in to the growing dispiritedness around him. Some people say that observing national days like Independence Day is essential, as it can educate the coming generations about the sacrifices our ancestors made for the formation of an independent state, and ceremonies are important for dissemination of correct information to the younger generation. Rashid Shafie, a local journalist who resides in Paretabad tells Kolachi that Idependence Day is celebrated in his locality with much zest his because the the residents love their country, and the day that symbolizes many things that are significant to it. He explains that the residents of his area are fond of celebrating festivals, and August 14 is no different. He adds that they celebrate every occasion from religious to national with same keenness and regard. But for last 60 years, Hyderabad, as an important city has failed to get the attention that it deserved, and poor planning of the city has actually converted a beautiful city into a mismanaged one. "There was a time soon after partition when the roads and streets of the city used to be washed every morning," says veteran journalist Malik Aziz who was an eyewitness to those golden days, adding that there were even piyos for drinking water for horses. He observes that the only thing that has increased or improved is the population. Aside from that, the poor management of the city has forced citizens to dwell upon why their city seems to be digressing rather than progressing, even as 60 years of independence draw to a close. The realities he underscored are an eye opener for policy makers, and perhaps a point of reference from which to understand where the city, and indeed, the country lack. When important factors such as upkeep of a city, and welfare of the citizens are neglected, then commemorating a national day will be the furthest thing from anyone's mind. Perhaps once basic amenities are provided to citizens, they will dust the film of doubt and grievance off their hearts, and allow them to once again learn to reflect the love they feel for their country, in theory, and practice. These celebrations will be a novelty for the generation which doesn't know what it feels to see ones' flag and leaders' images lit up by thousands of lights, and all the city's main buildings glittering through the night. For those of us who have not stop celebrating August 14 on a personal level, it is a sheer delight to feel the festivities on a national level. August 14 should not be treated like just another holiday to sleep in, it should a day when we should remind ourselves that a great migration took place between two countries. For students, the significance of August is that of the month when vacations end and school starts. These children don't care or know that if the blood of thousands hadn't been shed, we would not be living in our own home as we are. Of course that is not saying that we don't have our own problems to deal with, but then again, which country doesn't? This day marks the day we finally separated ourselves from the British Raj and that is why today, our green flag flutters high above us. The flag is an identity of any country in the world, similarly, our flag also holds a lot of importance in our lives, or should hold a special place. This is the same flag, with the addition of the while strip on one side, which was hoisted on important buildings in various parts of India before partition. People were punished for brandishing the green flag during the freedom movement. But now most people don't really care for the flag anymore, in fact they are more interested in red and white stars and stripes. One cannot blame them for this, since our generation has almost taught them to worship these lands, and look down at their own country. 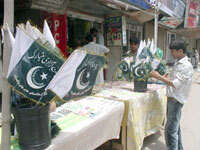 The Pakistani flag has always been used as a symbol of Pakistaniat; when people living abroad see their green flag at an Independence Day parade or any other event and hear the national anthem, they cannot help but shed tears of joy and pride to see their beloved flag and hear their anthem in a foreign land. But it is different here, it seems only a small number of people retain any respect for their flag. This is seen when people buy flags and streamers to decorate their homes for August 14, they use all the different coloured flags available - red, pink, blue and yellow and of course green. These people should refuse to buy the Pakistani flag in any other colour, because the original colour is 'green and white', and nothing else. Similarly, flags that have cartoon characters like Mickey Mouse should not be bought, as this loveable character has nothing to do with our Independence. I have never seen him in any of the photographs of our great leaders and am pretty sure he wasn't part of the freedom movement. Why such flags are being allowed to be sold is beyond me; it is disrespectful to our flag and to the memories of those people who gave their life to protect it from the enemy. Most people are unaware and apathetic towards the history of the partition. Many of them just read about it in their course books, and personalities like Quaid-e-Azam, Allama Iqbal and Rehmat Ali have been reduced to black and white print, and non-descript pictures. Whatever is learnt about these people is by rote, so students seldom retain any information they acquired. They have no idea that I I Chundrigar is not just the name of an important road, it is the name of one of our prime ministers, and that Nishtar Park is named after Abdul Rab Nishtar, an important leader of the freedom movement. The one museum which the belongings of Quaid-e-Azam doesn't have many visitors, especially not from the younger generation, but their elders tend to blame them for not taking interest as they are the generation which has too many distractions and you have to compete with these distractions to get their attention. For them the national anthem is just a song they sing in a language they seem to have little grasp of, and it seems tedious to stand in the heat in the school assembly sing it. They have not been told what the words mean and that one has to stand respectfully during the anthem and not shuffle and fidget through it. However, once again we can't blame them for this, it is our nurturing of anti-Pakistan sentiments within our children which has made them thus. We don't respect our national assets, songs, personalities etc, how can we expect them to? One might compare this situation to that of India's. India has its share of problems; girls are killed at birth, women are burnt by their in-laws because they didn't bring dowry, religious extremism can sometimes dominate emotion, there is excessive crime and poverty, human trafficking is rampant and the society, even now, is divided into a caste system, which means many human rights are suppressed. But the world still loves anything Indian, while Pakistan is looked at with suspicion. The only difference is that the Indians have opened their country to the world, seems to have a tolerant outlook, while we all know how Pakistan is viewed outside our borders. Indians are proud to be Indians; Pakistanis can't wait to leave the country for greener pastures. We should try and build our patriotic feelings for our country, so we can be proud of being Pakistani, and mend our ways and global image so that we are also treated respectfully by the rest of the world, so that people visit us as they do India. The history of partition is usually the most boring subject in school and somehow, apparently by sheer coincidence, the most boring teachers are appointed to teach this subject. If the Ministry of Education makes a little effort, the history of the freedom movement can be made extremely interesting but that would mean getting the best teachers and unique teaching techniques. The easiest technique would be to enact the situations or get the children to script any event they like design costumes and direct a short play to be staged in front of the whole school. The best skit or drama will get extra marks in the final exams. This will help them put their creativity to use and to learn from visual aid, and they will never forget how and why Pakistan was created. They may even turn out to be more patriotic than they are now. This can only happen if we all work as one unit, and it can still be done, it is still not too late. Kolachi: When and from where did you move to Karachi? Manzoor: I'm basically from Rahim Yar Khan, in fact my family is still there, where as I live here to earn money. I was about 10 years old when I came here in search of work, and initially did odd jobs, then I became a private chauffer, a job that I did for 20 years, and now after my physical problem I sell snacks at the Mazar-e-Quaid. Kolachi: How many members does your family consist of? Do they work? Manzoor: Including my wife, there are six of us. I have five sons; their ages range between 12 to 18 years. Yes all of them work, even the twelve years old. Kolachi: Don't you think your 12-year-old son is too young to work right now? Manzoor: I know he is, but I don't have a choice. All of us work and still we don't earn enough money to sustain a good living. But I'm very content and happy with my life; I have no regrets, in fact I enjoy my life exactly the way it is. Kolachi: How do you find Karachi? 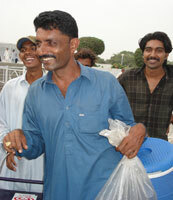 Manzoor: I believe Karachi is a city full of life. It is a nice place to live, and is mostly quite peaceful. Kolachi: Do you feel people here are different from those in Rahim Yar Khan? Manzoor: Karachiites are not what one would describe as sweet or soft, most of them are very practical and involved with the mechanics of their day-to-day lives. Kolachi: What sort of behaviour do you come across among the visitors here when you sell snacks to them? Manzoor: Well, although there are immoral and ill-mannered people everywhere nowadays, the ratio of good people against the bad has considerably declined, it is very sad. Out of every 100 people that I cater to, almost 90 misbehave with me. Kolachi: If given a choice, would you stay here, or go back to your hometown? Manzoor: Although I quite enjoy the hustle bustle of Karachi, I am more familiar with Rahim Yar Khan and more comfortable with the people there, so I suppose I would prefer living there rather than in Karachi. Kolachi: How do you celebrate August 14? Manzoor: It makes me really happy to see that we live in a free nation. We should make full use of this gift, and enjoy our freedom to the very core. Just look around you; everybody around you seems free and happy. I celebrate this day with utmost fervor. 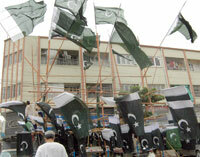 Back in Rahim Yar Khan, I hoist a flag on my home and send people sweets. Kolachi: How do people celebrate August 14 in the mausoleum's vicinity? Manzoor: People have loads of fun and enjoy the day. The place is packed with people and thousands of people visit the mazar all day long. National songs are played along with the national anthem. But of course there are a few exceptions that spoil the zeal and forget the main reason behind it all. Such people spoil the day for others too and don't give the Quaid his due respect. Kolachi: Any message that you would like to give people, regarding this special day? Manzoor: Please, please, keep your country clean. Respect the freedom that Allah has blessed you with and never forget what that great man, Mohammad Ali Jinnah, has done for us. No matter what occasion or festival you celebrate, please keep the poor in mind, help them and try to make it a special day for them as well. Manzoor Ahmed is everyman. He lives the ordinary life that most Pakistanis do, and like most of those people, is completely happy with the way it has turned out. His job is such that he must interact with hundreds of different kinds of people every day, and observe them. Being from another city though, he can point out the subtleties of behaviour that a native cannot. He might not be a very educated man living a remarkable life, but he lives every day knowing exactly where he stands in the world, and knowing exactly where his world lies. He is honest when facing and accepting the truths of life, yet has not let that quality make him bitter or brittle, lending that extraordinariness to the life of this Karachi character.